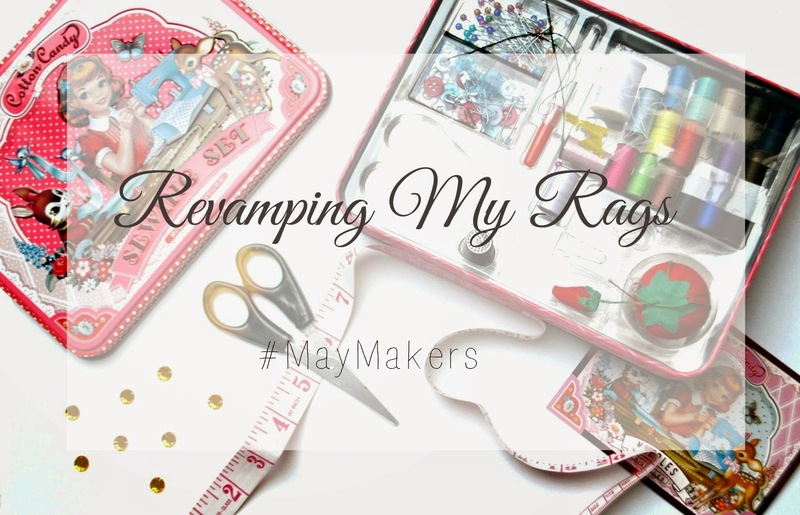 I’ve taken my time getting this post up as I really wanted to get stuck in with my brand new project “Revamping my Rags“. In a bid to save up some money to pay for other necessities i.e. driving lessons, I’ve put myself on a spending ban. Not just any old spending ban though, I am going to try my hardest not to spend any money on clothes over June. Instead I plan to go through my wardrobe and revamp stuff that I don’t really wear and change it up so that I will start wearing it again. Simple right? Well just to make things a little harder on myself because it seems that’s what I do, I’ve decided to take the challenge up a notch and see if I can revamp some items from my wardrobe and see whether I can design an outfit I could wear to an Indian wedding! I got stuck in and hit the drawing board. After some awful sketching I decided to scrap the drawings and work with the idea in my head that my very first outfit was going to be a sari style dress. I was originally going to attempt to make it all by myself from yards of fabric but it was for a wedding and to be honest I wasn’t sure I would be entirely comfortable wearing an outfit that might just fall apart whilst I’m sat next to the bride. Oh and did I mention the sewing machine thing? So instead I raided my wardrobe and my mums spare material stash. If you’re Indian, you’ll know exactly what I mean by that. After a good rummage I ended up deciding on a black A-line maxi skirt, a velvet long sleeved top and a whole load of orange fabric which would be used to drape around like a sari. To begin, I stitched the top to the skirt so that I had a long black silhouette. I decided to use the sleeves of another sheer top I had just because I thought I was getting somewhere. In fact I got a bit too excited at this point and because I thought this is so easy, the universe decided to punish me. I found the draping of the orange fabric so difficult that I can honestly say it cost me some serious blood (damn you needles) sweat and tears. A lot of tears. I ended up calling my bf and having a meltdown on how I can’t attend the wedding because I’m such a failure at life. Could I be any more dramatic? Well yes, probably. Eventually, after eating my weight in chocolate peanuts and listening to Taylor Swift’s album on full blast I managed to find the creativity & motivation I needed to pin it exactly how I wanted. Before it could fall out of place I stitched it all on. To cover up the horrendously messy stitching I then bought some gold rhinestone trim from a local button shop. I was happy again, it was finally all coming together. Now I could finally move on to the back. For this, I wanted something quite elaborate. 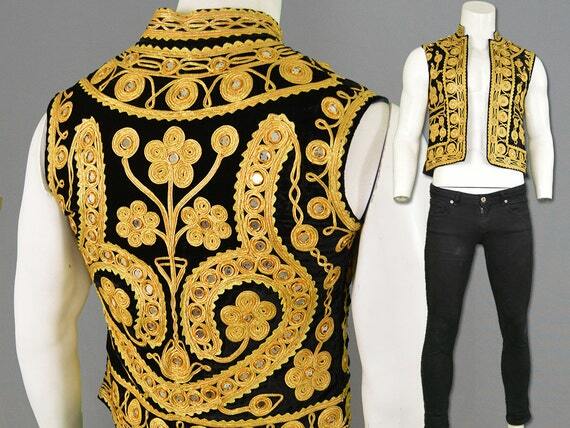 My inspiration came of these black waistcoats (Koti) often worn by Afghan/Indian/Pakistani men. I decided to stick with the black and gold colour theme and add a few orange gems to add some colour to tie it all together. I found some gold thread appliques on Etsy and sewed them into place. Next, I (and admittedly my dearest mother) stitched and ironed on what seemed like 1000 beads. After hours and hours of painstakingly slow progress, my very first fusion outfit was brought to life! There were certain things that I didn’t necessarily think through, such as the fact that there needed to be a zip put into the side so I can actually get in. Or the fact that I hadn’t bought enough gold trim, or that the front would be extremely plain. But in the end it was nothing that couldn’t be sorted. I managed to get a zip stitched into the side, hide the bit where the trim was missing and add some embellishment to the bottom of the skirt. The appliques that I ironed on to the bottom of my dress were also bought from Etsy. Even though it didn’t necessarily turn out 100% like the initial drawing I had done or the thought I had in my head; I absolutely adore how the saree style dress turned out. More so because I put a lot of hard work into it. It’s definitely worth trying your hand at making something you can wear from (almost) scratch. I love that it’s a one of a kind item that I know no one else will have. What are your thoughts on my creation?